1. Gums bleeding when you brush your teeth. Even a little bleeding is not normal. 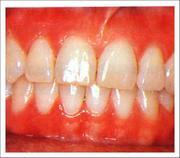 If you have a "pink" toothbrush, see your periodontist. 2. Red, swollen or tender gums. 3. 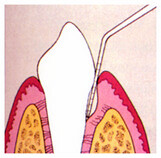 Detachment of the gums from the teeth. 4. 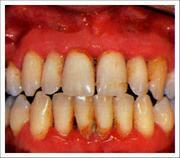 Pus that appears from the gumline when the gums are pressed. 5. 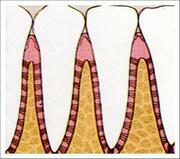 Teeth that have become loose or have changed position. 6. Any change in the way your teeth fit together when you bite. 7. 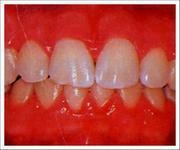 Any change in the fit of partial dentures. 8. Chronic bad breath or bad taste. 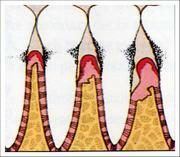 There are actually several types of periodontal disease. 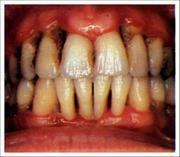 all are started by a bacterial infection that destroys the gums, bone and ligaments supporting the teeth. 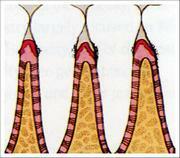 Periodontal disease progresses silently, often without pain or overt symptoms that would alert you to its presence. It may develop slowly or quite rapidly. Despite unparalled advances in dentistry and breakthroughs in research, periodontal disease remains a serious dental health problem. Nine out of 10 people are afflicted by it in the course of their lives. Responsible for considerable tooth loss in adults, periodontal disease currently affects about three out of four adults over the age of 40.